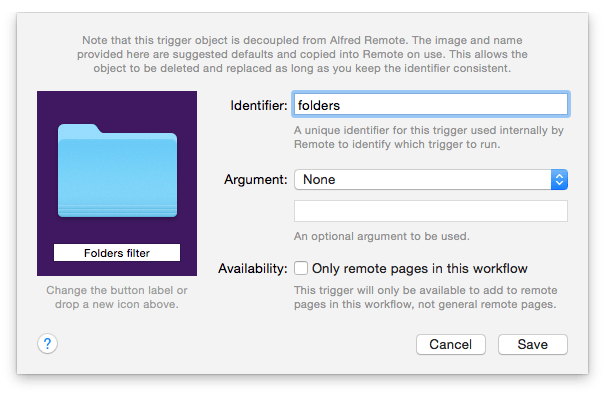 When adding Remote Triggers to your workflows, you can choose to make these triggers generally available to be added to a user's own Remote Pages. Alternatively, you might prefer to bundle your Remote Triggers into a pre-defined, well thought-out page. To do this, check the "Availability" box to make the trigger only available to Remote pages within this workflow. Once you've added all your triggers to your workflow, create a page by clicking the third icon in the top right of your workflow page. You can bundle as many pages as necessary with your workflow, and these pages will be included when exporting your workflow. Once Remote pages are bundled with a workflow, users can add them to their own Remote. To do this, import the workflow, go to the Remote tab and click the + button at the bottom of the left column. From the Workflows submenu, you'll see a list of workflows containing Remote pages and will be able to select the page you want to add. You'll be able to see whether a workflow contains Remote pages as the + symbol inside the third icon only shows if there are no Remote pages yet.